The Atlas B23-7 is a good model overall and an excellent runner with a smooth and quiet mechanism. 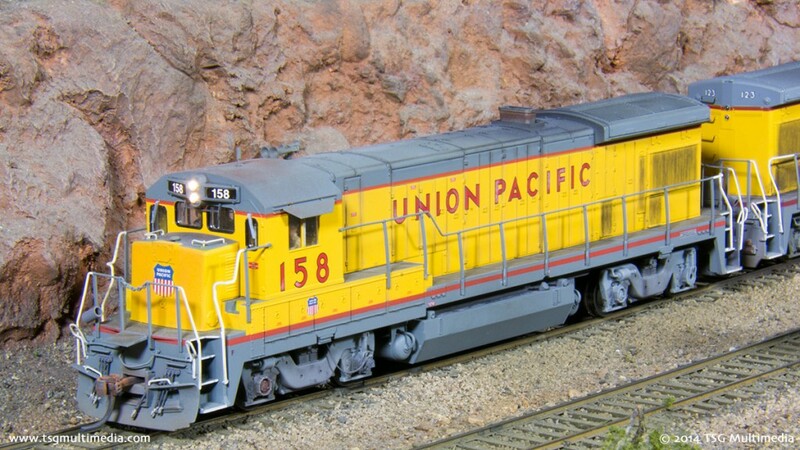 I actually own two of these units in Union Pacific colors, and both of them have received essentially the same upgrades. My other B23-7, UP 123, appears in the run-by shots at the end of the chapter as the second unit in the consist. Both are detailed and weathered following photos of these units in the early 1990s. Like most recent Atlas offerings, the B23-7 looks pretty good out of the box but has areas that can be improved. Like a lot of manufacturers, Atlas models a more or less generic unit. They did get the big stuff right. For example, UP 123 and 158 have slightly different grill arrangements on the rear of the long hood, and this is done correctly. Smaller details, though, needed changing. One area that needed attention was the roof. Atlas mounts an air horn dead center on the top of the long hood just behind the cab. On these ex-Missouri Pacific units, the air horns are offset to one side. To reproduce that I had to fill the original horn mounting hole, touch up the paint, and then install a better aftermarket horn in the proper location. I also installed a “firecracker” style antenna on the cab roof. The original plastic sunshades were replaced with more durable brass ones, and some of the windshield wipers were replaced with aftermarket parts that are closer to scale. The class lights were removed and the paint touched up. I got rid of the plastic plow that came with the model and replaced it with a more accurate aftermarket part. I also made new grab irons for the top of the short hood that are closer to scale than the plastic parts Atlas provided. 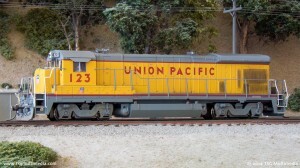 This B23-7, like many Union Pacific diesels, has MU cable holders attached to the handrails. In the program I show how to model these in a way that leaves them securely attached so that they will stand up to moderate handling. 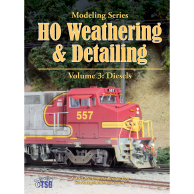 I also show how to add a brake chain and speed recorder to the front truck and more! I installed an ESU LokSound Select 6-function DCC sound decoder in this model. Since this particular unit had a sound-ready frame, I was able to use the factory speaker mounts. This engine has very basic lighting, but I did separate the number boards from the headlights so that they can be independently controlled. This is a photo of my other UP B23-7, 123. Interestingly, on this unit the horn is offset toward the fireman’s side of the locomotive, while on 158 it’s on the engineer’s side. 123 has the class lights painted over rather than removed, but is otherwise very similar to 158. 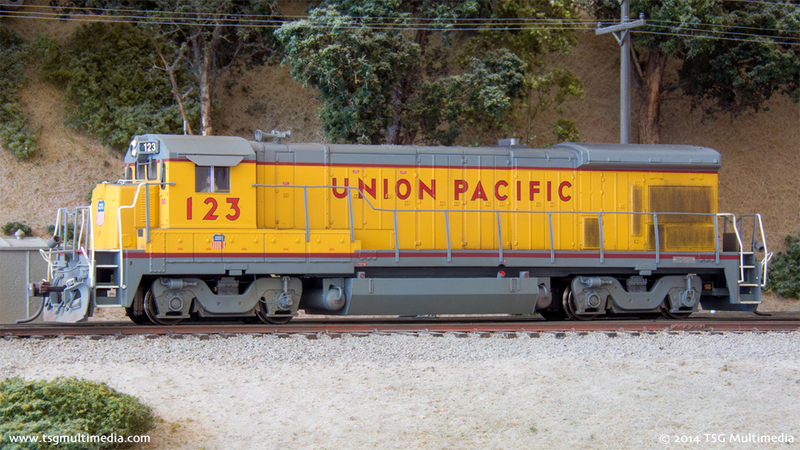 UP 123 was originally an unnumbered unit from Atlas. I used Microscale decals to add the numbers. They were not, incidentally, cut from the decal sheet in a block because doing that would have spaced them too closely together. I had to cut each number apart to reproduce the wider spacing evident in photos. 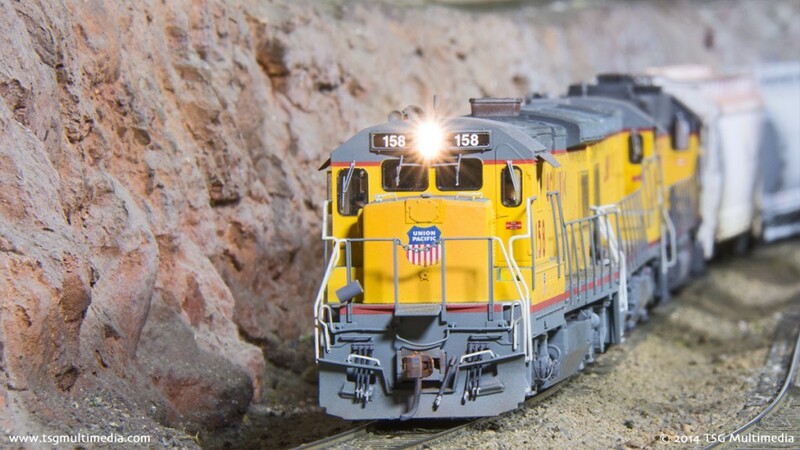 This unit also has an ESU LokSound Select DCC sound decoder.